Are you a fan of stylish interior design and making big statements? Does finding the right ceiling fan for your home make your head spin? Well, you’re in luck – Canstar Blue has spun together a guide on some super cool fans to keep you super cool this summer. Read on as we help make shopping for ceiling fans a breeze with these top picks that will turn your head! OK, enough puns. Bring on the fans! Below is a selection of stylish ceiling fans we’ve found, listed in no particular order. There’s no denying that these were a difficult choice – there’s hundreds of ceiling fans on the market, each more impressive than the last. But as each fan stepped it up in the style department, so did the price. So, we’ve combined a mixture of both cheap(er) and more high-end ceiling fans – but the fact of the matter is you’re going to have to fork out if you want to pimp out your ceiling! Take a look at what made the cut. If you’re looking for elegant luxury, look no further than Fanco’s Origin DC Ceiling Fan in the colour ‘Koa’, which resembles mixed woods (an aesthetic which can truly never go out of style). The fan features three lightweight plastic blades which arch outwards from the funky, almost egg-like middle motor. The aerodynamic blade design allows for a high airflow – 13,446m3/hr (cubic metres per hour) at 40 watts and the lowest speed only uses 2 watts. Fanco is an Australian company that has been producing fans, ventilation and air movement products for more than 10 years. It says it’s committed to innovation and sustainability with a firm focus on the future and new technologies. 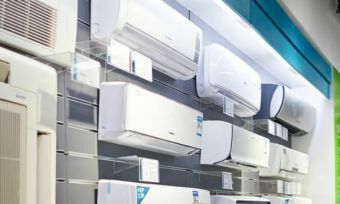 All this doesn’t come cheap though, with the fans retailing at stores such as Universal Fans and Ceiling Fans Direct for anything between $550 upwards to $800+ depending on availability, sales and individual retailers. If you’re into the Koa look, but not into the price of the Fanco fan – never fear. We’ve found this beauty which gives you the best of both worlds, Hunter Pacific’s Aeroforce 2. The body and canopy is made of die cast aluminium, whilst the three polymer plastic blades wrap around in the classic colour of Koa (there are also some other great colour combinations such as matt black and white, etc.). The fan is powered by a motor of 76 watts, which moves 15,918m3/hr on the highest of three settings. Hunter Pacific International is a family-owned company that was founded in the 1980s, that has since grown in size but maintains the same values – good design, high quality, superior service and technical innovation. That’s according to the company, of course. Not only these, but the prices are slightly more affordable. Grab this one from a retailer such as Universal Fans for $329. Sometimes you just need a timeless, classic white piece – and this Vento Swish DC Ceiling fan is exactly that. Understated and effortlessly cool, this fan will be the finishing touch to any living space. The uniquely shaped fan is small, but still manages to deliver airflow of 8,665 m3/hr at 41 watts as the interconnected blades spin to create an interesting illusion of multiple layers. The Swish is advertised as having quiet operations, and hence is a great option for smaller rooms such as bedrooms. It also features a dimmable LED light with eight different colour options, all operated via a remote. Vento is a brand that is part of the Sheng Yuan Electric Co, and Pan Air Electric which was founded in 1981. The brand states that Vento itself is Italian for ‘wind’ but stands for ‘award-winning design’. As you may guess, the brand was designed with luxury in mind, as well as practicality. Catch this one for $849 at any major fan retailer. Did you know that ceiling fans can be useful in winter, too? That’s right – when we talk about ceiling fans spinning backwards, we really mean it. In winter, certain models such as the Vento Swish or Martec Elite offer a reversible function which can switch blades to work anti-clockwise. This pushes warm air down the ceiling and along the walls to keep the room warmer. We understand that not everyone can afford to splash out too much for a fan, so if you’re on a budget – this one’s for you. The classic and simple Elite Ceiling Fan is a no brainer for the ones who want a stylish ceiling fan without too much dramatics. With a current price of $146.99 on The Lighting Outlet, it also won’t break the bank! The Lighting Outlet has stated that it has received an overwhelming response in customer satisfaction as the finish and quality of the Elite apparently resembles a product worth closer to $400-$600. The fan, which comes in six different colour schemes, is made from ABS (a mix of thermoplastic and polymer) and features a 50-watt motor. Martec is a company that was founded more than 50 years ago, focusing primarily on ceiling fans, LED down lights and bathroom fixtures. It says that it incorporates the latest cutting edge developments in order to create products that save energy and money. This one is for the slightly adventurous – a tropical fan in the shape of leaves. If you’re keen to spice up your life, you’ll be pleased to hear that the Cooya is currently on sale for $268 at Ceiling Fans Warehouse. The ABS plastic-made fan comes in at 132cm with a three speed wall control, as well as a remote. It hits a max airflow of 7,522 m3/hr, so we would suggest that this bad boy is placed in a smaller room for maximum impact. The company, Mercator, states it has been producing affordable lighting and fan designs that bring style, comfort and function to homes for more than 55 years – and the Cooya is just that! Feeling a bit more switched on after that? Hopefully this guide has helped you decide (or at least blown you in the right direction of) your brand new ceiling fan!